West Brom boss Darren Moore paid tribute to Wigan Athletic’s preparation as his side came up short at the DW Stadium. The high-flying Baggies - most experts’ favourites for promotion - suffered a rare blip thanks to Josh Windass’ 74th-minute strike. And Moore was magnanimous in defeat despite his obvious disappointment. “I just think you have to give Wigan credit for the way they played and their game-plan,” he said. “We tried to come here and win a game, they tried to win the game, and the ball’s fallen to their lad once - and it didn’t for us. “We’ve all seen the Championship for long enough to know those sort of games are lying in wait for you. “And I’ve got absolutely no complaints on the day. “It was a game where both teams were battling, not much goal action, whatever chances there were it was all off target. 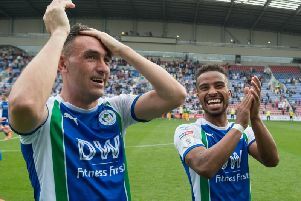 West Brom have been banging in goals left, right and centre in recent weeks, but couldn’t break down a determined Latics rearguard featuring Dan Burn as stand-in left-back in the absence of Antonee Robinson. “Sometimes in football you can’t quite put your finger on what’s gone wrong,” he added. “For so many weeks now we’ve scored goals in the last 20 minutes, half an hour. Moore also didn’t have any quibble with the sending-off with six minutes remaining of Jake Livermore for a second bookable offence, which dashed any hopes of a Baggies response.